If you're thinking of installing liquid fertiliser storage tanks, or maybe just replacing the ones you have, this is the ideal time to do it. Better still, we can help you. Proper siting and maintenance of your storage tanks will ensure many years of valuable service. 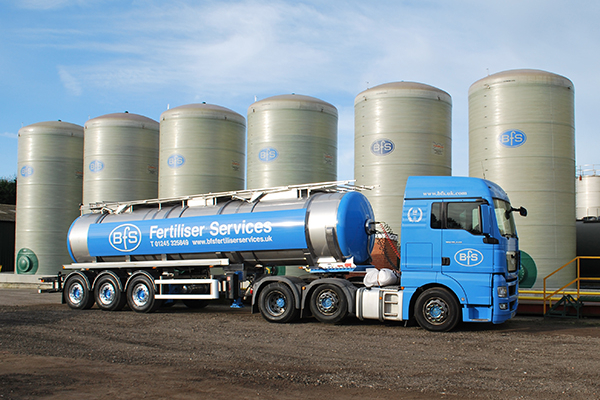 We at BFS Fertiliser Services can advise you on where best to install your tanks and how to look after them. Not only can we help you identify the prime location, but we will be in attendance when they are installed. And we will check them when we deliver. It's all part of the service to our liquid fertiliser customers. The following guidelines for installing and maintaining liquid fertiliser storage tanks are based on AIC best practice. All new liquid fertiliser storage tanks should be sited within a bund capable of retaining 110% of the contents of the tank in the event of a leak or rupture. Tanks must always be placed on flat, level, concrete bases that are able to withstand the weight of the tank and its contents when full. Where possible, tanks should be clearly visible allowing them to be effectively monitored. Ideally, however, they should not be easily recognisable from areas frequented by the general public, to reduce the risk of tampering or theft, i.e. away from a main thoroughfare or footpath. No site should be within 10 metres of a watercourse or a drain leading to a watercourse, and local geological conditions should be taken into account. Inspect all tanks and mobile bowsers for possible corrosion or damage. Inspect associated valves and pipework to ensure proper and leak-free operation. Lock all valves and sight gauges when not in use to minimise the risk of vandalism or theft. Observance of these guidelines should help prevent accidents, damage and loss, and contribute towards trouble-free operation. NB A complete list of storage tank guidelines can be found at: AIC – code of practice for the prevention of water pollution from the storage and handling of liquid fertilisers.